Paul Matthews reached out and asked if it's possible to create a "For a selected item" Flow against Site Pages. @johnnliu is it possible to create a 'For a selected item' flow against Site Pages? Typing custom values as flow cannot find site or library, but displays correct columns. Then after saving the flow it doesn't appear on the Site Pages under flow. I was able to reproduce what he's asking fairly quickly. May be you just want the solution. The solution is that you need to use the "list guid" as the custom value for the SharePoint For Selected Item trigger, not the List Title. Ah you are still here. OK, buckle yourself in, we are going another Flow adventure. I do this of course, with another Flow. SharePoint Site Pages don't know anything about my Flow. It thinks there's no Flow connected to it. So we know Flow can run on the Site Pages library, just not "Our" Flow. I want to compare the JSON definition differences. So I created a Flow to assign the Request sign-off Flow to me. This is necessary to add myself as a Owner to this Flow. Now I open these two Flows with Flow Studio. Checking the trigger JSON, I find that the Flow on the right (not working) has "Site Pages" as the name, but on the left (working) has a GUID as its name. We explained the problem - it is the Site Pages not appearing as a choice - it's not a List nor a base Document Library. Typing the name "Site Pages" doesn't work. The solution is to use the list Guid. And the debugging steps takes us to SyncFlowInstances, Modify FLow as Admin to assign a new template flow back to me as the owner, and finally using Flow Studio to change the existing "Site Pages" to the list guid. This Saturday - 14 July, we'll be converging on SharePoint and Office 365 Saturday Canberra. I'm planning to take my time and drive down for the weekend. The event is held at Microsoft office this time (so not at the previous Clifton's venue). We will be covering a mix of Office 365, modern SharePoint, and security topics. I'll be around all day as well - ask me anything about SharePoint, Flow, PowerApps, Office Development, Todo, Xbox and everything! I believe we have an Xbox One and a bunch of swag to give away too! But you are definitely coming for the wide range of content and topics, and definitely not for the swag. Sorry about the catchy headline. I will start by saying I am perfectly ready to see a response post containing 20 things in Azure Logic Apps that we wish are in Microsoft Flow. The point of this post isn't about whether one product is better than another product, it is simply to highlight the very-intentional design differences and how as users we have access to both and should make our choice accordingly. If a comparison must be made, then I think in reality, they are better seen as two siblings - LogicApps is the big sibling with more features, Flow piggybacks LogicApps, but itself has several unique tricks and sometimes, features do move between them. I love both teams & products. To best describe Flow to an Azure / Logic Apps person, Flow is Logic Apps + power-user / human workflow-focused workloads, combined with a mobile experience and better in-product integration. As a result, it caters to a whole different set of scenarios that Logic Apps isn't focused on. Flows can have multiple owners, but it can also have a Resource as a owner. The best example of this is in SharePoint connector. A Flow can be 'owned' by the List or Library resource - so if we grant a user library owner permissions - that user automatically can see and modify the Flows owned by the resource. This is awesome because we don't need to manage two sets of user ownership sets. Several Flow connectors has a concept of the Run-As user, that is, the user can select a resource like a document or a library, and run the Flow as the current user. LogicApps connectors can only run as the maker. 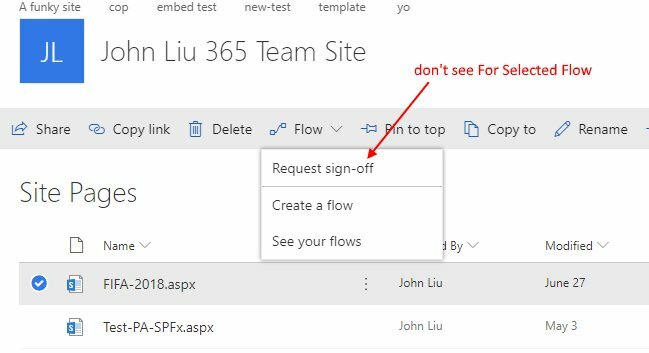 Flow implements a simple set of approvals API with both one-must-approve as well as everyone-must-approve, this is setup with Office 365's Actionable Messages, so tasks can be completed directly from email. These are also available within the Flow Mobile app. These approval tasks can be reassigned, and there is a history trail of them in Flow. In LogicApps - human approvals can be built Outlook's Send Approval Email. Flow can send Mobile Notifications to the accompanying Flow mobile app. Flow has digital buttons called "Flow Buttons" these appear as quick triggers on the Flow Mobile App, but is also a really easy way to set up a run-now test trigger. Flow has a PowerApps trigger (and response) that can send structured JSON data to and from PowerApps. This makes it much easier to use Flow as server-side middleware to extend PowerApps (which is client-side). LogicApps has to publish custom connector (which can then be used in Flow and PowerApps). Flows are created and grouped within Environments - an environment can have unique assets grouped, as well as shared custom connectors, and data leak prevention policies. Logic Apps are grouped within subscriptions - you either have access to the subscription or you don't. Selected Row is part of the product integration feature of Flow - in which, Flow can be created and ran from within other products as part of an integrated experience. Two examples we have right now are in SharePoint and (soon) in Excel. On the roadmap there is also Outlook integration. This trigger is specific in that in each of these integrated experiences, you can select an existing item (in SharePoint list, in Excel row, or in an email) and start a Flow with that item as the source trigger. Additionally, Flow can run as the current user (see #2) as part of this integration. Flow has several builtin analytics charts out of box with PowerBI. Logic Apps has Log Analytics integration and users can build their analytics via Insights. In Flow, the Flow Management Connector is a meta-level connector that lets you perform reflection-like actions on the Flows within your current environment. You can even use Flow to make other Flows. Somewhere, there is an insane Flow engineer that says wouldn't it be ultra-meta to deploy Flows with Flow. Logic App's Logic Apps connector only lets you list other Logic Apps in the current subscription and run them. To deploy LogicApps - talk to Azure Management API to deploy ARM templates. Think about this. Flow can read itself. Flow can call Azure Machine Learning. Flow can update itself. Business Process Flows replace the old Business Process workflow in Dynamic 365, and is a way to build a "state machine" that triggers and transitions between different business process stages in Dynamics. This integration with Dynamics platform isn't available in LogicApps. Flow as part of the Business Application Platform had on-premises integration through the Data Gateway functionality first - including calling on-premises SharePoint, SQL, File System and REST endpoints. This feature was integrated back to LogicApps later as well. I connect SharePoint to my Minecraft via the Data Gateway with a custom REST API. Flow, Logic Apps, Azure Integration - these are a multi-headed effort to move expand in multiple directions, each under a specific product offering. Specifically, Flow's special powers fall under these categories, some are easy - others not so easy to replicate back in Logic Apps. In Dynamics and Office 365, because we get a generous pool of free Flow runs as part of the license, Microsoft Flow can be cheaper. Flows cost per run. So it encourages building long-running, multi-step Flows, suitable for human workflows. But in my own experience - some of the Flows that I call a lot (but doesn't have too many actions), it's actually cheaper to switch those to Logic Apps. I consider these Flows more like Middleware calls - HTTP Request, do a few actions, finish. Also, in building Flow Studio that works across tenants - I've opted to use Logic Apps rather than use the Flow runs of a single Office 365 Tenant. Different scenarios, for different needs. Github tweeted a link to a NPM NodeJS CLI project that uses data from http://football-data.org. Seeing that, I decided we need to build a SharePoint Modern SPFx webpart so we can load it into all our Intranets. First let's look at the data source API. That's nice - we don't need to figure out which competition is the 2018 World Cup. It's 467. "configure Parse JSON to make our lives easier"
Parse JSON is a detailed exercise that requires a full post by itself, since it requires description of various problems that we'll see, and how to get around them. The Parse JSON step is the next blog post. If we skipped Parse JSON - then we'll need to manually type out the expressions. If we used Parse JSON - then the step to select the properties are easier. We do the work in Parse JSON to describe what the types of the properties are - this allows the dynamic content pane to be more intelligent in showing us the appropriate choices. Still have to type out the date conversion to local-time, unless you want UTC time. We have our nice HTML table now. Basically, fetch the contents of the HTML from fifa-2018-fixtures.html and write that into DIV#fifa-games element. You can also just use the old Content Editor webpart and use Content Link property to the file, but that doesn't work on the new modern pages. 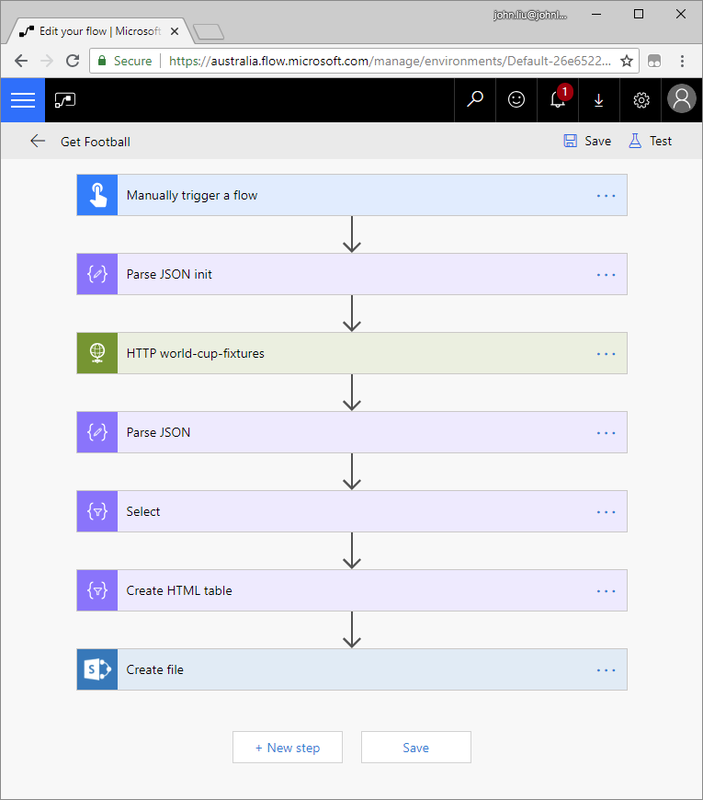 #FlowNinja did a bit more work on pulling the FIFA data back via @MicrosoftFlow write it to HTML (with local time). Then wrote a simple script for @mikaelsvenson SPFx Modern Script webpart to display the static HTML (refreshed daily). Works really well in Microsoft Teams too. football-data.org has an Events API where they will call our callback URL when a team scores in a game fixture. This requires a first Flow to loop through all the Fixtures in the FIFA 2018 competition and set up an event call for each fixture. Then when those games are played - if any goals are scored - we can call the same parent Flow to immediately update the result HTML table. This implementation won't require a scheduled recurrence to refresh the data daily (or hourly). It can be refreshed on-demand! When calling the football-data.org API without an API-Key, there is a max rate limit of 50 calls per day. We can sort of see this in the response header (it goes down by 2 per execution). Now because this is running from a Microsoft Flow server, I have no idea if your calls are rate-limited by the same IP address as someone else running this in your Azure Data Centre region. So if you do see rate limit, it is better to register an API Key with an email address, and then add that to the HTTP Request Header. This is a problem I worked on with Fausto and is a common problem I see when working with rows of data in Microsoft Flow. Group-by is a common problem - but usually we see this a lot in the form of batching rows of data to some sort of output. One frequent example is a schedule that looks up a bunch of tasks or messages for the day, and sends only ONE email with a group of tasks to that person. How do we do Group-By elegantly, and quickly. Yes, group-by can be done with for-each and append-to-array, but that approach leads to fairly complex looking inner loops and wide-layout if-conditions. The solution that we got at the end is an elegant one with two for-each loops. It is easy to follow and easy to test - which means you can easily reconfigure it to your own scenario. In each loop, we use the union() expression to combine two arrays. Union has the special ability that if an element already exists in the array it is omitted. We do the union in a compose action, and then put that result back into the array variable. That's first loop. Easy to test - one expression. Second loop involves looping through the first array of unique_names, and the first action stores that value into a compose step. Then use Filter array to select only the rows with that unique name from the original table. I append the results as an object to a running array of results. But it is also very easy to just send email at this point. For each unique name (or email), this sends one email, the email body is a summary HTML table of the items in the list for this person. Expression operations like Compose, Filter, Select or Union are fast - most of the time running 0-second. For Each steps and set variables are slower - because there are global locks being applied. By reducing use of variables, we can make the loop go much faster. Two elegant loops. No crazy if-conditions and checking if a value already exists in an array during append. This is a very useful pattern if you are sending daily emails or summary notifications to a user and you want to batch the results. I wanted to end here on more loops. Loopity loop.